In this episode, we spoke with Joanne Cuthbertson, former Chancellor of the University of Calgary and Director and Leadership Council Co-chair of the Perimeter Institute for Theoretical Physics at the University of Waterloo; Stephanie Felesky, Vice Chair and Governance Chair of the West Campus Development Trust and Co-Chair of the Calgary Health Trust NICU Campaign; Kate Fischer, Senior Corporate Counsel at AltaGas Ltd and Co-Chair of the Calgary Health Trust NICU Campaign; and, Rebecca Morley, Corporate Director and Chair of the Audit Committee of Birchcliff Energy and former Chair of YW Calgary. 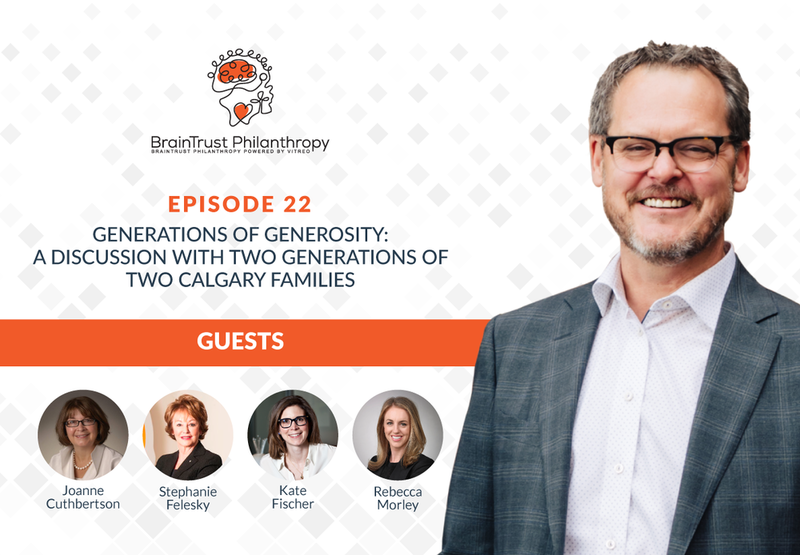 Our topic was: Generations of Generosity: A discussion with two generations of two Calgary Families. What has changed and what has not changed in fundraising, philanthropy, and volunteering?